This attractive 16-story apartment building at 239 Central Park West was erected in 1926 and was designed by Sugarman & Berger, and Henry S. Lion. Sugarman & Berger also designed One Fifth Avenue, 45 Fifth Avenue, 340 Riverside Drive, 685 West End Avenue, 25 East 86th Street and the White House apartments on the northwest corner of 86th Street at 261-267 Central Park West. 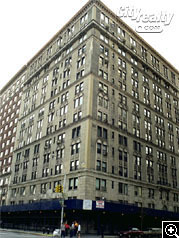 The beige-brick building, which is also known as 2-8 West 84th Street, has 15 floors and 75 cooperative apartments, some of which are duplexes. The building has wood-burning fireplaces, formal dining rooms, a doorman, basement storage and four bandcourses. It has no sidewalk landscaping, no garage and permits protruding air-conditioners. There is good cross-town bus service at 86th Street where there is also a subway station. In 2005, Jeff Zucker, NBC chief, sold a 16-room duplex on the 11th and 12th floors to Marti Meyerson and her husband Jamie Hooper for $15.7 million. Ms. Meyerson is the daughter of Morton Meyerson, former chairman of Perot Systems.